This elegant traditional home is located on one of the most prestigious blocks in the Northwest Woods of East Hampton. Situated at the end of a long drive you will reach a gate that lets you enter this 2 acre special property. The house was constructed with the highest quality level and only the best in materials. From the moment you enter into the gracious foyer you will be impressed with the bright and light ambiance created by the double height ceiling and wall of glass in the living room. The chef's eat in kitchen is a delight and features every amenity for cooking and being with friends and family. It leads to a charming screened in porch overlooking the lovely grounds and includes a formal dining room for those special meals. The spacious downstairs master suite features a stunning bathroom and his and her walk in closets. The upstairs begins with a junior master that is sure to impress guests and family alike. In addition to the 3 additional bedrooms there is an amazing gym and home office for all to enjoy. The lower level has a media area and kitchenette that is perfect for spending free time. 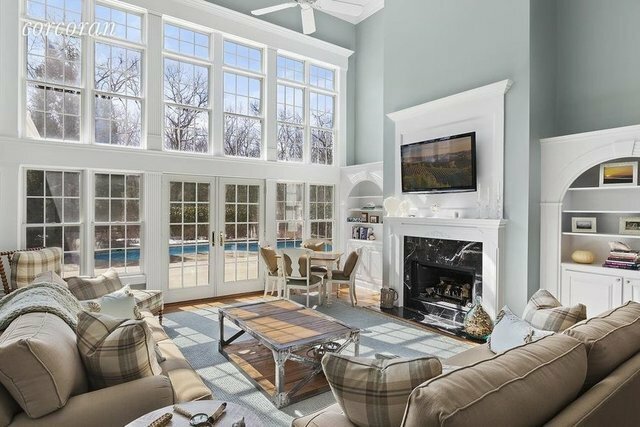 The beautifully landscaped grounds surround a free form heated gunite pool for fabulous summer entertaining or to simply relax on the patio. Community tennis is available just down the bucolic lane and the home is located not far from beautiful ocean and bay beaches and the historic Village of East Hampton.